Will Jarman Victoria Bridge is my attempt to squeeze a couple of square miles of bright and sunny countryside into a shelf sized box; to hang like an illuminated picture on the wall to switch on during those dull winter evenings. 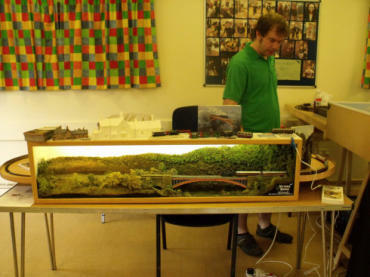 The bridge and stone abutments are created, using photographs, with modern laser cutting and 3D printing techniques. The rest of the scenery is more traditional in composition. It seems to capture the distinct, usually tranquil, atmosphere of the valley; there is no particular secret apart from lots and lots of layers. 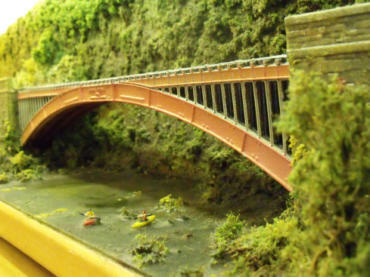 The scene is based on the bridge as it exists today as part of the preserved Severn Valley Railway. Look out for familiar modified tank engines and stock from recent years and occasional bigger guest locomotives.. it must be a gala weekend! If a modern freight train appears, please do not be alarmed, the scene has simply shifted a few miles upstream to the near-identical Edward Albert Bridge in the Ironbridge Gorge, which carries regular coal trains to this day.